New York, NY, June 30, 2010 - Knappogue Castle®, producer of a super-premium line of single malt Irish whiskies, announces the first time release of its 12 Year Old Single Malt Irish Whiskey. A new package design reflects the change for this producer from vintage dating to age designation. As the original vintage dated whiskey, Knappogue is undertaking this change to bring greater clarity to the age of the product. "We found that some consumers didn't realize how long Knappogue Castle Single Malt was aged, therefore missing a very important part of what we do to make it smooth, bright and spicy" observes Mark Andrews, son of the brand's founder. "We want to be perfectly clear about the age of Knappogue Castle Single Malt. Now, there's no need to calculate how long it was aged because we're stating it boldly on the front label. The age of the product is something we're proud of along with the fact that no color is added" says Mr. Andrews. "Although our standard offering will be the 12 year old single malt, we will continue to have special bottlings of rare and unique distillations which will most likely bear a vintage date." 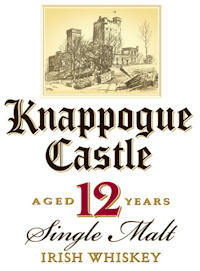 Knappogue Castle® 12 Year Old continues an Andrews family tradition of exceptional quality Irish single malts. Mark Edwin Andrews, the first modern-day owner of the 15th Century Knappogue Castle in County Clare, Ireland, followed his passion. First, he restored Knappogue Castle to perfection, and then he turned his passion to bottling exceptional quality single malt Irish whiskies. He was an innovator and was bottling single malt Irish whiskey when everyone else was bottling blends. Knappogue Castle 12 Year Old Single Malt has a bright, light lemon-orange color (no caramel coloring is added) and an elegant fruit, mildly spicy, citrus taste. The product retails for around $42.00 for the 750ml and will be on retail shelves starting this July. Knappogue Castle whiskies are imported by Castle Brands Inc., an emerging developer and international marketer of premium branded spirits and wines in seven categories: vodka, rum, whiskey, cognac, liqueurs, tequila and wine. Based in New York City, it is one of the few small public companies in the global beverage alcohol industry.